It's good to have friends in the legal world. Dansy send me the below email in response to my conjecture in the previous post that the reason for lipstick case knives being illegal must have been interesting. It's not, really, but the sole recorded instance of ninja stars being used to assault somebody else is. Your blog inspired me to put my legal researching skills to the test, as I just got my LexisNexis certification. I fear you will be sad to know that not a single person in the U.S . has ever been assaulted with a lipstick case case. However, a handful of kids have been busted for possessing them at school. Many people have been assaulted with slungshots, usually with very horrific and not funny results. As far as unusual slungshots, a prison inmate fashioned such a device out of a sock filled with deodorant canisters purchased from the prison store. He used it to hit his new cellmate in the face. Many people have been busted for possession of ninja stars, shurikens, death stars, throwing stars, or any like instrument. However, very few people have actually used such an instrument to assault someone else. In fact, I could only find one 1987 Texas appellate case, excerpted below in pertinent part. Talk about a character you couldn't make up. I particularly enjoyed this man's explanations to the court regarding his prior criminal convictions. The record indicates that the appellant backed his car into someone else's automobile, after which they blocked his departure from the area. He then assaulted the victim with an ax handle and an oriental throwing star. No blows were struck and there were no injuries. The proof revealed that the appellant has previous convictions of arson and shooting a missile calculated to produce death or bodily harm into an occupied dwelling. At the sentencing hearing he explained these prior charges, telling the judges that they really didn't amount to anything. When the occupants of a "little old cabin" on his mother's farm refused to vacate, he burned it down. He received a three year sentence for arson. A dispute over his job provoked him into shooting into his employer's dwelling. He received a two to three year sentence, of which he served ten months. He also had other shooting charges which were dismissed or nolled. For some prior offenses, the record does not show a disposition. Subsequent to this offense, the appellant was in a serious automobile accident and is now classified as a "walking quadriplegic." He is confined to a wheelchair most of the time and is receiving treatment for post-traumatic distress disorder resulting from his Vietnam service in the United States Marine Corps. He recently takes four different medications for that condition. He contends that because of his condition, the fact that no one was injured and because he acted in self-defense that it is unfair for him to not have probation. Based upon his prior record, it is clear that the appellant is not a suitable candidate for probation. Well there you go. I responded that the relative lack of documented cases of people attacking others with ninja stars was odd, given how often it happens in the movies I watch. In fact, I rarely have the patience to watch even a TV episode in which characters aren't constantly throwing ninja stars. Dansy then responded. i did find a few cases where attackers dressed up like ninjas to commit assaults with more ordinary weapons. i also found a case where a guy had his conviction for possessing a cane sword overturned because he did not know the cane he was using was not an ordinary cane. if he had known, i'm sure he would have used it to cut the guy he was fighting with when he was arrested. 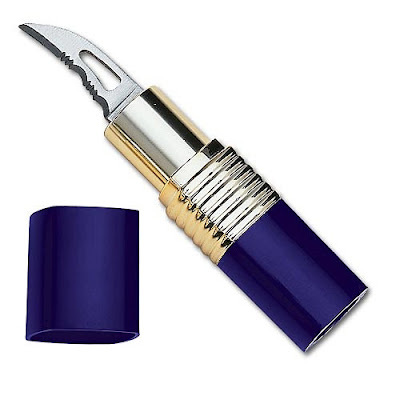 And for the record, here's an image of a lipstick case knife, or as trueswords.com more sensibly calls it, a "lipstick knife." Actually a pretty dangerous looking blade, even when confined to a lipstick case. Final note: Isn't it funny how the URL for trueswords.com almost looks like "truce words," especially since anybody shopping there probably isn't the least bit interested in truce words? Actual final note: "Hey, Pam, let me borrow your lipstick—OW!" This is nice. Although it scares me to think that it could simply scratch my attacker and become more agitated. Maybe it should be aimed at somewhere more lethal.